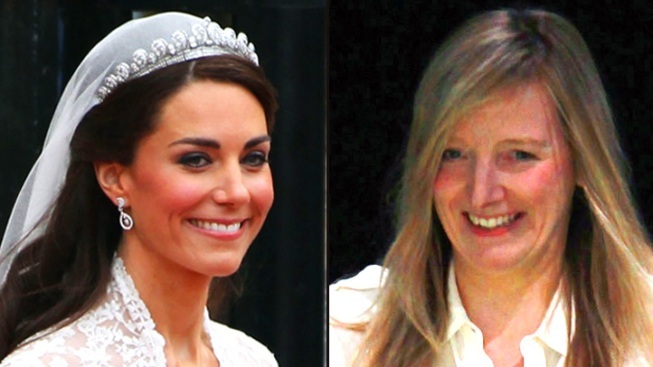 Catherine Middleton ended months of speculation when she stepped out of a chauffeured Rolls-Royce at Westminster Abbey wearing a Sarah Burton for Alexander McQueen wedding gown. The gown’s hand-cut English lace and French Chantilly lace bodice and skirt, almost ten foot train and ivory satin bodice which draws on Victorian traditions of corsetry are sure to become instant trends in the bridal market. The lace appliqué for the bodice and skirt was hand-made by the Royal School of Needlework and the back of the dress is finished with 58 gazar and organza covered buttons fastened by Rouleau loops. Burton and the McQueen team even made the wedding shoes, which are made of ivory duchesse satin with hand-embroidered lace. Middleton completed her wedding look with a tiara made by Cartier in 1936 and lent to her by The Queen and diamond earrings by Robinson Pelham.